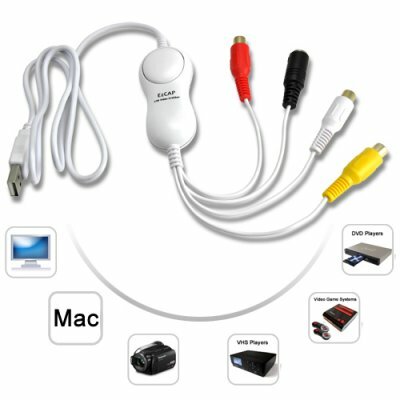 Successfully Added USB Video Capture Device For Mac (AV to Computer) to your Shopping Cart. Capture streaming video directly to your computer with this USB video capture device. This easy to use USB video capture device takes video from sources such as TVs, DVD players, camcorders, VHS players, and video game systems, and captures them digitally to your computers hard drive for easy file transferring and quick video playback. This is the perfect way to record your favorite TV programs, create videos for YouTube, or simply a great way to get rid of those old VHS and camcorder tapes that are collecting dust in your living room. Why would you want to digitize old VHS and camcorder tapes? Let’s face it, analog tapes take up space, are inconvenient to watch, and have a limited shelf life. Why not protect your beautiful memories and make watching videos fun and convenient by going digital? The included video editing software makes it easy to select only the scenes that you want to save, and converts them to user friendly computer files. You can even use the software to improve the image quality of your existing videos! With the K64 you can capture video from any device with an A/V or S-Video OUT port and can even convert your video to the following formats: DVD, SVCD, VCD, MP4, AVI, PSP, MOV, DIVX. This allows you to easily load your videos to YouTube, MP3 and MP4 players, PSP, iPod, or your online web-page. With the K64 can even copy your entire DVD collection with ease! Simply attach one end of the K64 to your DVD player's AV OUT port, attach the other end to your computer's USB port, press "RECORD" and that’s it! Copying DVDs has never been so easy! Whether your a baseball fan wanting to capture the world series or a parent who wants to remaster their camcorder tape or VHS collection, the K64 can help you get the job done and provide you with a whole new form of entertainment you never knew possible. Capture live video and play it back whenever you like, add subtitles text or movie captions, improve the image quality of your old video tapes, create video for your cellphone or iPod, with the K64 you can do all of this and much more from the convenience of your home! Order the K64 now while this product is in stock and ready next day shipping. From the leader in wholesale electronics, Chinavasion. Use the included video editing software to create your own movies! Software instructions are provided for installation and software use. The round circle on this device that looks like a button does not have any function. Must use video capture software with this device. Can use included software or commercial software purchased elsewhere. Evaluate the included trial software for yourself. You may decide you need more advanced features, in which case we recommend that you try out some of the popular open-source titles or purchase a commercial software package. To be honest, TIVO is a set top box solution which offers a lot more features than the CVMK-K64 can offer you. Having said that, think about the price. Also this video capture device comes with Chinavasion's famous 12 month warranty.